When you are looking for a lawn mower that can handle a large lawn or commercial mowing please consider the Country Clipper, an Iowa designed and manufactured mower. We are so proud to represent this line of quality equipment designed for zero-turn mobility, power, and rugged dependability. The Country Clipper is designed to handle residential, estate, and commercial lawns, and offers a size to fit your needs as well as options and accessories, which are second to none. This line begins with the Wrangler, a residential mower with its 41" to 48" cutting decks, joystick steering, and up to 3.1 acres per hour mowing speeds. For the larger and commercial needs there is The Boss model with 60" and 72" cut with several engine choices including the 25.5 HP Kawasaki, 27 HP Kohler as well as the 35 HP Kawasaki V-Twin and 37 HP Kawasaki Digital Fuel Injection engines. 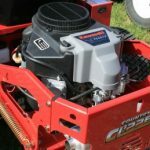 Country Clipper, a division of Shivvers Manufacturing Inc. of Corydon, IA, has been a pioneer in the development of the zero-turn style mower. Tie this rock solid engineering and manufacturing with our sales professionals who understand the unique challenges of maintaining a large lawn and you have a winning combination. 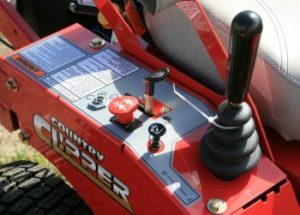 Let us show you the Country Clipper model that will reduce your mowing time while providing you years of rugged service. Every Country Clipper offers plenty of horse power to provide the muscle needed for large mowing decks as well as the speed needed to mow quickly and safely. Rear mounted engines put the weight over the rear wheels for added traction and operator comfort. The Country Clipper line also features the patented Stand-Up Deck system for easy cleaning and maintenance. When it comes time to consider the right piece of equipment for those large mowing projects or for your commercial mowing needs come see the Country Clipper line at Kramer Ace Hardware. Every Country Clipper mower is fully assembled, serviced, and ready for delivery. Let us help you find the right mower for your needs and we will be happy to discuss the options and accessories that you may want to add to the basic models.